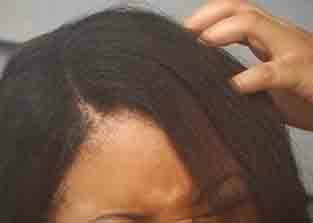 " Scalp itch has a variety of causes, from frequent hair washing in hot water to stress (see below for list) or even seasonal factors such as humidity. Itchy scalp causes frequent scratching, which exacerbates the itching. Common causes of an itchy scalp include dandruff, overuse of a harsh shampoo, new hair treatments such as hair coloring chemicals, hair oils which irritate the scalp, seborrheic dermatitis, and psoriasis. If you have started anything new, avoid them to see if itching stops. Then use a PH balanced shampoo to soothe the scalp. If not better than try a medicated shampoo such as one of the products listed below. If you do not see any improvement see a Dermatologist or Doctor who will look at the physical symptoms to determine the cause. Trying dandruff shampoos or anti-itch liquids with different active ingredients can help to treat your particular itch. If the condition does not respond to shampoos or treatments, then a visit to a doctor is suggested." Scalp itch is commonly caused by dandruff or the use of new hair product which irritates the scalp. Dr. Rasya Dixit discusses common causes of scalp itch and how to treat it. There are many causes of scalp itch (also called scalp dermatoses). The most common causes include seborrheic dermatitis or dandruff, scalp ringworm, eczema, allergy to something new used in the hair (allergic dermatitis), psoriasis or head lice. Each cause is described below. Dry Scalp: Scalp skin that lacks moisture and a protective layer of oil can cause itching. Dry scalp can be caused by frequent hair washing, washing hair in water that is too hot or shampooing too aggressively and using a blow dryer too close to the scalp. Also, if a regular shampoo or conditioner (or the chemcials in the products) is too harsh, it can cause itching. Winter weather, when their is also low humidity in the air can also contribute to the condition. Neurogenic Excoriation: Scalp excoriation is an emotional condition where a person scratches their head excessively, often due to stress. The frequent scratching can cause small cuts which will lead to more scratching as the cuts heal. Dirty Hair: Hair with an excessive buildup of oil can cause skin cells to build up on the scalp and cause dandruff and itching. Dandruff: White, greasy flakes of skin will appear on the scalp and cause itching. The condition is not harmful, but can itch. It is not due to inflammation, but to skin flaking, which is a normal process. Another form of flaking called seborrheic dermatitis also starts with dandruff skin flaking. In more severe cases it is accompanied by yelloowish pimples can appear along the hair line, behnd the ears, in the ear canal, on the bridge of the nose, along the nose and along the eyebrows. It can also cause yellow greasy flakes that occurs when the oil glands become irritated and produce excessive amounts of oil. This type of dermatitis can also occur when the face oil glands become inflamed. It is seen in infants under 3 months and in adult between and 30 and 70. It is seen more often in men than women. Cradle Cap: A condition typically found in newborns, when oil glands produce excessive amounts of oil. Shingles (Herpes Zoster): nerve inflammation from the chicken pox virus. Lupus erythematosus: an autoimmune disease and type of lupus that causes skin inflammation. It has asymmetric, elevated and well-defined red flat-topped plaques with a firmly adhered scale. Scalp Psoriasis: this condition causes skin lesions that are the result of new skin cells being developed faster than old skin is replaced. These new cells form bunches or thick white scales on the surface of the skin which cover red, flaky patches. Allergic contact dermatitis: bright red demarcated patches. May or may not have cell scaling. Usually caused by the application of a new hair product, gel or shampoo. Eczema: Healthy skin helps retain moisture and protects you from bacteria, irritants and allergens. Eczema is related to a gene variation that affects the skin's ability to provide this protection. Causes skin to become red, dry, flaky and itchy. Head Lice: Severe scalp itch can be caused by an allergic reaction to lice saliva. Check for nits which attach to the hair shaft at the scalp. Spread from head to head contact. Prurigo Nodularis: Papules or plaques that are elevated. Lesions are inflamed. Actinic Keratoses: Scaly and rough papules. Papules are yellow or red on inflamed skin. Seasonal scalp itch: Scalp itch of unknown cause which occurs when a change in seasons and weather results in humidity and conditions such as dry scalp. Medications: may cause dry scalp or other scalp related problems. Seborrheic Dermatitis: common condition due to overgrowth of yeast on the skin. Also called cradle cap. Symptoms of itchy scalp include excessive itching and redness on the scalp. Flakes on clothes, especially in the shoulder area or on the forehead, is also a sign of scratching due to itching. Diagnosis of itchy scalp can be performed by a doctor when examining the scalp. A Doctor will look at the color, distribution, shape, size of any lesions and patient history. Thyroid testing if itch (pruritus) is accompanied by feeling tired or hyperactivity. Scalp itch treatment depends on the reason for the itch. In the case of dry scalp, using a shampoo specifically for dry hair can reduce the itching, and in reverse, excessively oily hair should be shampooed with shampoo for oily hair. For dandruff or other flake issues such as seborrheic dermatitis , a dandruff shampoo can be used. Be sure to leave the shampoo on the hair for 5 minutes and then rinse. Use the selected shampoo everyday until the problem is controlled and then reduce to 2x per week. Treatment can last for several weeks. It may be necessary to try different dandruff shampoos or skin treatments to treat dandruff and seborrheic dermatitis to determine which works in your particular case. Pyrithione zinc: Found in Matrix Biolage Antidandruff Shampoo, Head and Shoulders and other common dandruff shampoos. Salicylic acid: Found in Scalpicin Anti-Itch liquid. This approach is helpful is the underlying cause is dry skin, seborrheic dermatitis or psoriasis. Ketocconazole: This ingredient is an anti-fungal and is often used to treat scalp itch problems. It comes in a cream or shampoo in products such as Nizoral A-D.
Cradle cap is usually treated using mineral oil or baby oil. 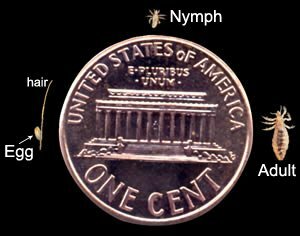 Head lice are treated with a special over the counter or prescription products (malathion, Benzyl alcohol lotion or Lindane shampoo) and a comb to remove the dead larvae and eggs. If two people share a bed, both are usually treated. The CDC recommends not using a shampoo/conditioner combination product or to rewash the hair for 1 to 2 days after the lice medicine is removed from the hair. Over the counter products contain that active ingredients pyrethrins combined with piperonyl butoxide and are found in the the Rid lice removal kit. A Doctor will prescribe a topical corticosteroid like Derma-Smoothe FS oil (fluocinolone acetonide .01%). The oil helps to moisturize the scalp. This is used along with a medicated shampoo such as Clobex. For sunburn, cool showers or apple cider vinegar can be used to calm the itch. The key to avoiding scalp itch is to protect the scalp against harsh chemicals or other ingredients that can cause skin irritation. Avoid using super hot water when bathing to avoid washng away natural body oils. Also, try purchasing shampoos that are suited to your hair type. In the winter, scalp irritants include wool, such as wool hats, dry indoor areas and rooms that are kept above 68 degrees. In summer, wash chlorine off of hair, protect hair with a cap when swimming and avoid sunburn.